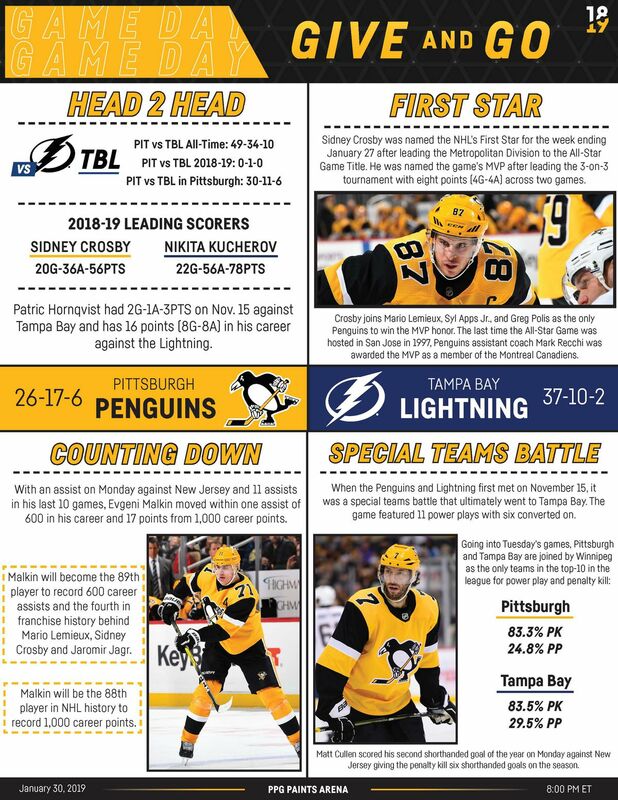 Tonight’s matchup between the Penguins and Lightning will be the game of the night. Tonight the Lightning will go for their 21st win in 25 games. They have been the best team in the NHL since Dec. 2 and are 13 points ahead of the next best Eastern Conference team, the New York Islanders. Tonight’s matchup against the Penguins will be their first game since their 6-3 win over the San Jose Sharks on Jan. 19. The Penguins had been on cold streak being 1-4-0 in their last five games. On Monday night they suffered a 6-3 blow out loss against the last-place New Jersey Devils. This season the Penguins are 1-7-1 against last-place teams in their divisions. Outside of playing last place teams, the Penguins are 25-9-5. Expect to see a different version of the Penguins tonight against the Lightning. Both Matt Murray and Andrei Vasilevskiy are expected to start in net tonight. This will be the second matchup of the year between the two teams. The last match up the Lightning won 4-3 on Nov.15. After this game, the Penguins will travel to Tampa on Feb. 9 to finish off the season series. Forward Tyler Johnson will return to the Lightning lineup tonight after missing their last victory against the San Jose Sharks (Jan.19) with a lower-body injury. Defenseman Jack Johnson is expected to play tonight after leaving their last game against the New Jersey Devils. Defenseman Justin Schultz joined the Penguins morning skate today. This is the first time back on the ice since being injured (fractured left-leg) against the Montreal Canadiens on Oct. 13. This will be an exciting match up between the two Eastern Conference contenders. Tampa Bay’s number one offense and power-play makes them better all-around. Pittsburgh showed weakness in defense after allowing six goals against the Devils last Monday. Tampa is expected to win this matchup after having a long break from the bye-week and All-Star weekend. They should be well rested for their first game of their four-game road trip.